When Sister Bernadette Carlow celebrated her 50th Jubilee in September, she also received a little-known recognition. Sister Bernadette, a hospice chaplain for more than 20 years, was honored in the monthly edition of Amedisys SPIRIT for demonstrating “care and service from the heart.” Since 1994, she has ministered at Amedisys, a national organization that delivers personalized home health and hospice care to thousands of patients and families in their homes. 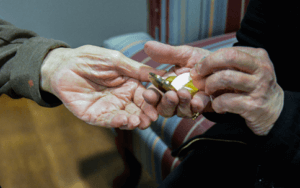 “Sister Bernadette made eight visits to support the patient and spouse during (his last) 16 days. She was able to help with life review, offered prayers and the rosary, and had deep worthwhile discussions with the young spouse on the acceptance of death. Along this beautiful journey, Sister Bernadette exemplified the core value of passion, according to the SPIRIT. She was not only pleasantly surprised by the recognition in the article, but also by the personal phone call of gratitude from a top Amedisys administrator. With a quiet and caring spirit, Sister Bernadette regularly visits the homes of small towns in the Mon Valley area, such as Donora, Brownsville, Charleroi and Monessen, where she offers comfort and support to hospice patients and their loved ones. “Many of the elderly folks I visit have outlived their family and friends. Often, elderly people are lonely, isolated and afraid. In many cases, fear melts away with my listening and brief, hopeful messages. A kind word, a prayer, or a small gift means so much to older citizens,” she says. Sister Bernadette says she is humbled by the trust that patients have in her. Send a note to Sister Bernadette.